Michael Reiger is one of the owners and artists of Lapis Gallery in the Tennyson Street Cultural District of northwest Denver. For 13 years, the gallery has showcased the works of local and national artists, while also creating custom pieces in wood, clay and steel for a variety of clients across Colorado and around the U.S., including Z-Cuisine, Amendment XXI, and Brassene Felix in Denver. Michael has a BFA in Photography and in Sculpture from the University of Colorado at Boulder and has created art through photography, clay, oil pastels and steel for more than 20 years. His work has been shown in numerous galleries. As a historical photographer, he has worked for the Federal Emergency Management Agency (FEMA) for 14 years at more than 28 disasters, including 9-11 and Hurricane Katrina. His photographs are in collections that include the Smithsonian National Museum of American History; the Tribute Center, New York; the Library of Congress; and the Colorado History Collection. HAVE YOU SEEN MANY CHANGES IN THE ART GALLERY BUSINESS IN DENVER SINCE YOU OPENED LAPIS GALLERY? Oh yes. When we opened 13 years ago, there were only two other galleries on Tennyson Street. We wanted to generate some foot traffic, so we started First Friday back up, where on the first Friday of the month, the galleries would stay open late and offer food, wine, and sometimes music. In those early years, we would get 150 people for First Friday. Today, there are 18 galleries in the Tennyson Street Cultural District, mixed with coffee shops, bakeries, boutiques and restaurants. For First Friday during Denver Arts Week, we had 4,000 people and there are now bands and entertainment. Even our regular First Fridays attract 2,000-3,000 people. TO WHAT DO YOU ATTRIBUTE THE GROWTH AND SUCCESS? Well, a lot of it is attributable to people getting out and coming to see the district. The block has taken off. What really helped start it all was former Denver Mayor (now Colorado Governor) John Hickenlooper and Ginger White from the Denver Office of Cultural Affairs supporting the arts and helping the arts districts grow. They recognized the economic importance of the arts and have offered a lot of support to help arts districts get established. The gallery map that the city produces has helped a lot of people find us and bring people up to the district. Another thing that has helped is the new liquor laws written regarding art galleries. That was done very well with the interests of the galleries in mind and makes it much easier for us to hold events and attract crowds. DO MANY TOURISTS MAKE IT UP TO THE TENNYSON STREET CULTURAL DISTRICT? I know I love to find the hidden gems of places when I travel. If you explore the galleries and arts districts of a different city, you'll find the spirit and life of that city. Art, great food and culture like to grow up next to one another. That's certainly true on Tennyson St. We have a very hometown feel and are very family friendly. People often come for the food, but stay for the art. We have some great restaurants now and some of the best barbeque in the city. We have people come every month for First Friday from Summit County and from throughout the metro area. But I don't care if people come from Colorado Springs and Wyoming or from Lakewood and Littleton. It's home-grown tourism. The important thing is to get people out to see the arts districts. WHY DOES TOURISM MATTER TO A NEIGHBORHOOD DISTRICT LIKE TENNYSON? Well, Denver Arts Week has been very helpful to us. It's been beneficial to get the different arts districts together, it's given us a better and stronger voice. We always do something special on Tennyson for Denver Arts Week and that has given us our biggest crowds. We had an art bin last year with art for the "Mile High" price of $52.80 and that was very popular. But Denver offers itself as a tourism product with the mountains, some great museums ... and art. People come to see the museums, but part of that should also be seeing the local art. We're always looking for angles to connect with the museums and VISIT DENVER to bring people into any of the arts districts. Denver Arts Week has helped the districts work together. The more the districts can become known, the better it is for all of us. Maybe a tourist will see three art districts on this trip, and plan to come back to see three or four more on the next trip. 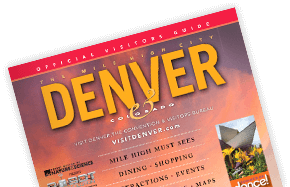 They'll see great art, taste great food, and discover the real spirit of Denver.